The humble looking smoke bomb was developed for the first time in 1848 by Robert Yale inUK. He experimented with firecrackers that were popularized by the Chinese in the 17th century and manufactured these in his lab. Gradually, he went on to perfect the formulation that resulted in the creation of fireworks that spewed dense smoke which lasted for a greater length of time. These smoke bombs are prepared by blending potassium chlorate (an oxidizer), sugar (functioning as a fuel), an organic dye in powdery form, and sodium bicarbonate that works as a moderator preventing heat buildup. Once this mixture is ignited, the organic dye starts to evaporate and is forced out as smoke. Following are some simple tutorials on how to make a smoke bomb in the comfort of your home. Though it may not be possible to manufacture a smoke bomb exactly like the ones you buy from a fireworks shop (owing to lack of resources and/or expertise), you can always make a crude smoke bomb on your own. First, you have to get the ingredients needed in making the smoke bomb. The ingredients you’d generally need are KNO3 (potassium nitrate or saltpeter), sugar, frying pan, and aluminum foil. Mix potassium nitrate and sugar in a 5:3 proportion, that is, five parts of the former and 3 parts of the latter. Transfer the contents to a skillet kept over an oven. Here it is important to note that mixing a greater proportion of potassium nitrate is necessary for making smoke bombs that emit thicker smoke quite rapidly. Light up the burner and swirl the mixture slowly with a ladle or spoon keeping the heat low. Keep a close watch while you’re stirring and if you notice that the sugar grains have started to liquefy, then take off the pan, and further lower the heat before you can proceed. Then pour the mixture in a container and after it cools down a bit, decant the content onto a foil, and make small or big lumps out of the mixture. These lumps are veritable smoke bombs. See how to make a smoke bomb is relatively easy. Making smoke bombs is much easier when you use ping-pong balls. And all you’ll need are ping pong balls, aluminum foil, lighter, and a pencil. Make a hole or opening in the ball. This hole should be sufficiently deep allowing you to poke a pencil fully. Envelope both the pencil and the ball with aluminum foil. See to it that the pencil is not fully wrapped as it is poked to make a good conduit for the smoke to come out and will be removed later. Your smoke bomb is ready and you just need to ignite it with the lighter. If you’re wondering as to how ping-pang balls produce smoke, you’d be pleasantly surprised to know that a ping-pong ball is nitrocellulose material which is inflammable. For creating the bomb, you’ll need nothing less than two balls. Cut one ball into small strips or shreds with the help of a sharp knife. The more strips you make, the longer will the smoke last. Next, you’ll need to make a neat circular hole in another ball so that you can insert the strips into it. Wrap this ball with aluminum foil in several layers but the opening should be visible. Punctuate the ball by making as many microscopic holes as you can so that the smoke gets innumerable channels to escape. Find a wicker, light it up using a cigarette lighter and toss it into the ball; or toss a lighted matchstick inside it. The procedure of formulating a smoke bomb using ammonium nitrate as the chief ingredient is engrossing as well. For this technique, you’ll need a cold pack, a piece of old newspaper containing numerous sheets or pages, and a bucket. A cold pack could be purchased from any chemist shop or drugstore. You’ll have to take out the water bag first, remove the granules of ammonium nitrate and transfer them into a bucket. Put on gloves or hand mittens before you handle the pack. Keep water in very small quantities to fully dissolve the chemical. Be careful not to pour excessive water as that may dilute the ammonium nitrate and neutralize its inflammability. Now separate the old newspaper into several parts and fold all of them twice. Immerse them in the chemical solution for roughly half a minute so that newsprint soaks enough liquid. Take out the sheets, unfold very carefully, and let them dry out in the sun. Be sure to use old newspaper for the new ones have wax on them, preventing them from absorbing enough ammonium nitrate solution. Make proper rolls when they dry fully and tie a string to maintain their form. Light the rolls in a secluded area that is desolate as the fumes can be toxic for both humans and pet. If you followed the tutorial on how to make a smoke bomb with ammonium nitrate but the bomb failed to work, do be disappointed and with some experiments, you will make it. 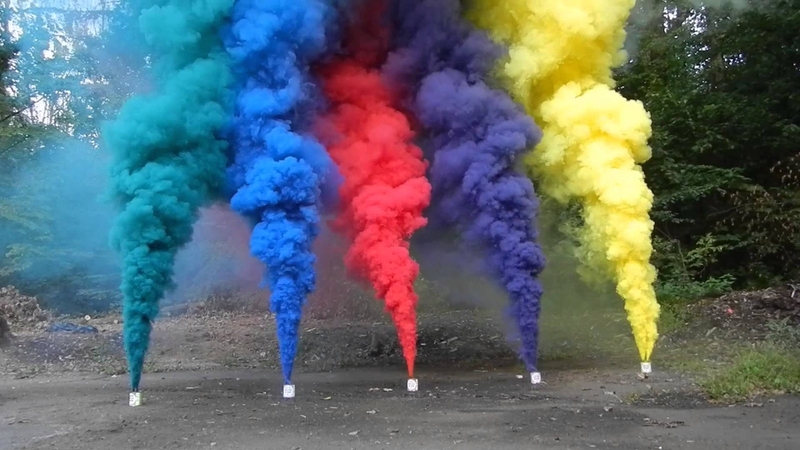 Making smoke bombs that emit colorful fumes is simple as well. However, you may have to give up the idea until and unless you can procure some ingredients that are to be found only in a laboratory or know someone who can supply you with the same. The ingredients you’ll need will invariably depend upon the color of smoke you’re looking to create. If you want to produce a bomb that emits red smoke, you’ll need to mix 4 parts of lactose, 3 parts of potassium chlorate and 13 parts of para-nitroaniline-red. Then ignite the mixture and enjoy your red smoke. If you want to produce a bomb that emits white smoke, you’ll need to blend 4 parts of potassium nitrate, 5 parts of charcoal, 10 parts of sulfur and 3 parts of wood dust. Then ignite the mixture and enjoy your white smoke. If you want to produce a bomb that emits green smoke, you’ll need to 35% potassium, 26% each of synthetic indigo and lactose and 15% auramine (yellow). Mix them well and ignite to get green smoke! Server responsed at: 04/19/2019 11:14 a.m.